One of joys of blogging is seeing other bloggers' photos of their trips to the ocean. I love the ocean, the waves crashing on the sand, the whitecaps racing to the shore, the shifting colors. But Wisconsin is a long way from anything that could be called a "sea." I think that sometimes I am subconsciously drawn to things that have echos of the ocean, like the yarn I chose for this Shredded Cowl. I LOVE this color, but as I near the end, I'm wondering what I think I'm going to wear it with. I tend more toward black/grays than blues. But I'm going to have to find something to wear this with. I want to keep it. And this novel is all about the mysteries of the ocean. I have laughed out loud many times at the wit of the narrator, a smart but snarky MBA type from California whose honeymoon in the Carribean takes a number of unexpected turns. 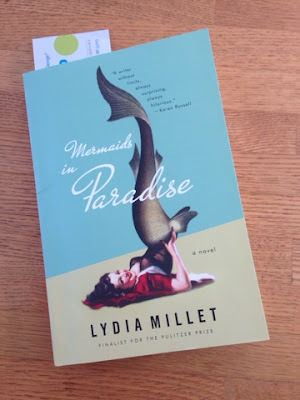 Now, I need to say that I don't like magical realism, and despite the presence of mermaids, this novel stays largely out of that territory. The mer-plot is handled deftly and does not require too much suspension of disbelief. 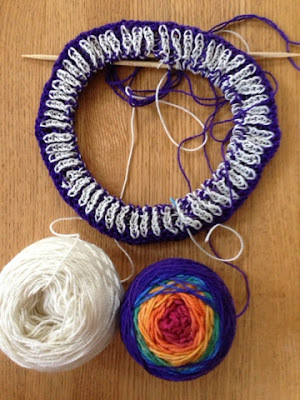 Don't forget to see what everyone else is crafting and reading over at Small Things' Yarn Along. About a decade ago, I wrote a story for a magazine about a murder that occurred there, and I learned a lot about how white America created and maintains the poverty in Indian Country. So, this is my little contribution: one baby blanket, three scarves, four pairs of childrens's mittens, and one pair of women's mitts. I know, it's not much. But it's more than nothing. If you want to knit for Pine Ridge, see the Ravelry group: For the Children of Pine Ridge. 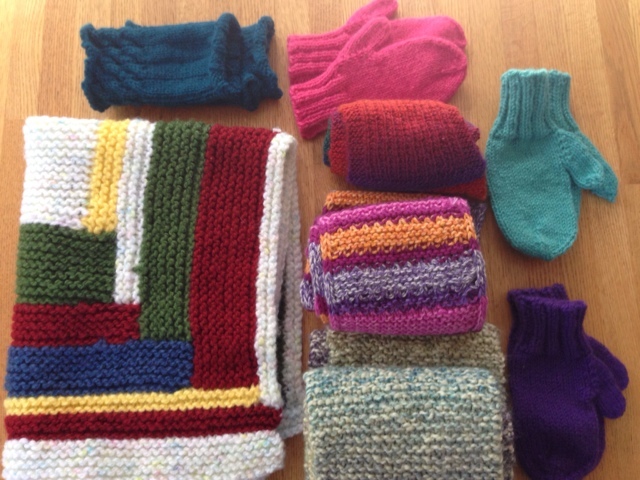 It is a very organized group that gets knitted items into the hands of people who need them. And join us for Keep Calm Craft On at Frontier Dreams. I know there were only five days in my work week, but it felt like 10. Usually I feel settled into the school year by mid-October but this year feels twitchy. I know that one factor is the continuing stream of new students we are getting from Milwaukee and Chicago. I got a new student this week, but he seems like an awesome kid. Still, every new special ed student needs a boatload of paperwork completed! At least I'm not alone in feeling like this is a tough school year. Friday morning one of my co-teachers walked in the door of our classroom and asked, "Who needs chocolate?" as she held out a bag of mini 3 Muskateers candy bars. So, I was ready for a quiet weekend. And my house is more than ready for a decluttering. I started the day by heading out for coffee with a friend. She wanted to go to The Sow's Ear, a coffee shop/yarn store in a nearby town. It was a beautiful drive. The sugar maples are showing their richest scarlet color, and the fields are a lovely fall gold. And, I managed not to buy anything! I've begun to call this "My Big Dumb Shawl." It really is beautiful, thanks to the unspun Icelandic yarn, but it is a LOT of garter stitch. And now the rows are really long! Can you believe I'm even showing this in public? I'm a bit surprised myself! It really is awful. I just have so many projects going at once. 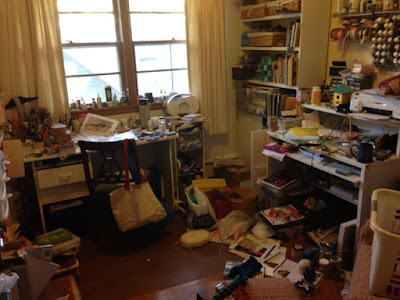 And it is so much more fun to create than clean up, so every 6 months or so I have to do a major decluttering and reorganizing. This time I'm going to try to get rid of some stuff, too. Maybe a lot of stuff. The Madison Knitting Guild has more than 500 members now and all those dues add up to enough money to bring nationally and internationally known speakers to our meetings. I was SO excited about our October speaker: Kristin Nicholas. If you haven't checked out her books or blog, do so ASAP. Her use of color is amazing, as you can see in these samples she brought. She is so nice and down-to-Earth. She lives on a sheep farm with her husband and daughter in western Massachusetts. 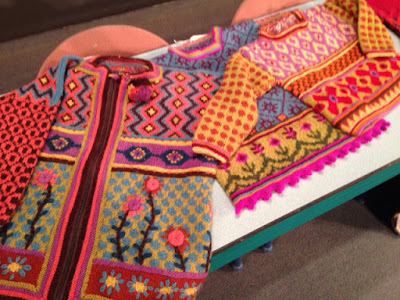 Her house is as colorful as these sweaters; this woman is brave with a paint can! How does she come up with this stuff? She does tons and tons of swatches. She just plays with colors until she finds something she likes. 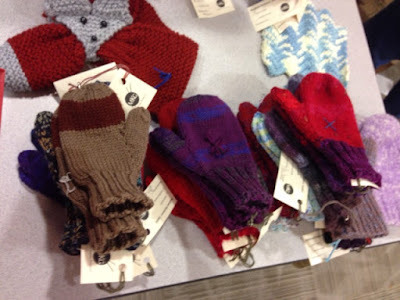 There was a table heaped with donated winter items. I was inspired! 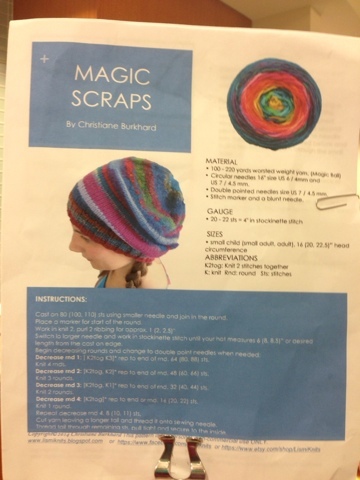 So I took a bag of scrap yarn and I'm going to learn to do Russian joins so I can make a magic-scrap ball and knit a charity hat. It was a great evening and it made me appreciate living here, where there are so many knitters! I'm very happy with the way this is coming out -- but then how could it fail to be fabulous with that yarn? 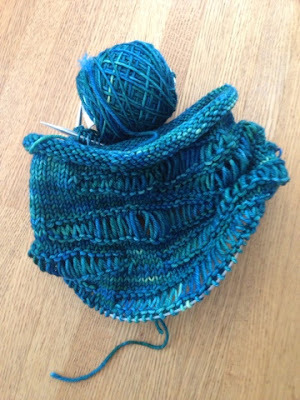 I know I sound like a broken record, but do check out the Knit Circus web site; Jaala Spiro has an amazing color sense. As a teacher myself, I couldn't help but analyze Amy's teaching style yesterday. She doesn't just teach you a serious of steps; she teaches you how the stitch works. As a result, you understand what you are supposed to do and why. I actually frogged the above because I decided I wanted a tighter gauge. The fact that I was able to restart it all by myself speaks volumes for Amy's teaching. She gave a gallery walk that was fascinating. She talked about how "desire" is one of her main themes and recalled the "girlie" calendars her dad brought home from work. (Her grandfather opened the first auto parts store in Madison, and her father ran it for many years. My grandfather started his career at that store, but then opened his own 50 miles away in Beloit, where I grew up.) She talked about her process and how she's always on the lookout for bits and pieces to incorporate in her work. She even pokes around at Joanne Fabrics on occasion! I realized that I have never asked her about any of this, which may seem odd since I am so interested in art and creating. The fact is that I have always been in awe of her. Phyllis is a "real artist." She has made her living as an artist. She has sold works to top museums around the world. She has won a Guggenheim Grant and been a Fullbright Scholar. 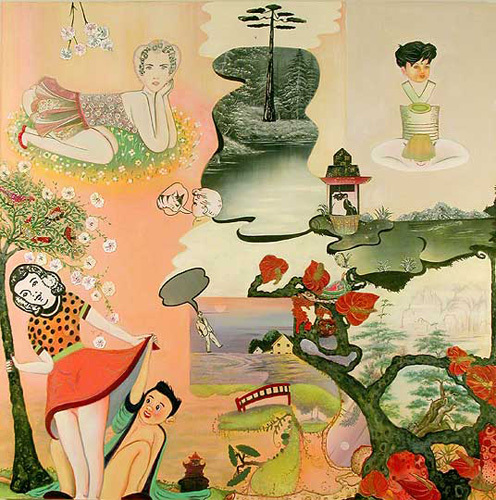 She has taught at the University of Illinois in Chicago and the Chicago Art Institute. Despite all this, she is a warm and friendly person. Outspoken, intellectual, funny. Who wouldn't be a bit in awe? And for those of you who live in Chicagoland, this exhibit will open at the Chicago Cultural Center in Summer 2016. What do you get when you combine the upcoming holidays and fall? Yes, I am hard at work on my Green Bay Packer socks. 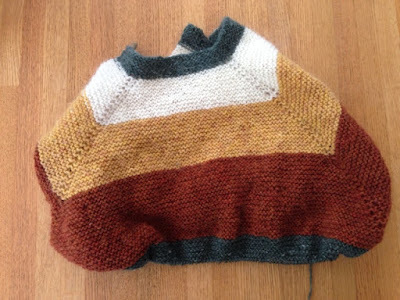 I hope the color comes through on screens because Jaala of Knit Circus really got the colors right. I think they will be a perfect gift. And work has been intense, so mindless knitting is much appreciated! 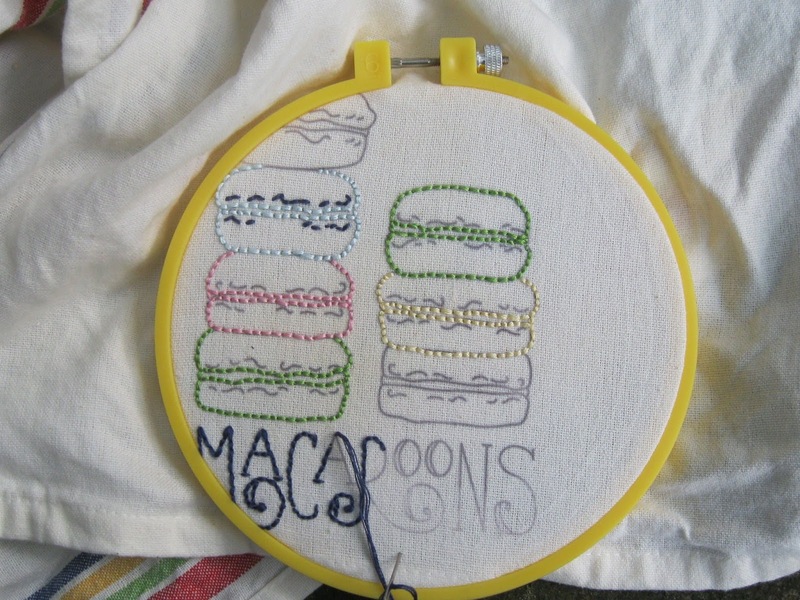 I"ve also had an itch to get back to embroidery, so I opted for an iron-on design and a dishtowel. Eventually this will be a gift, too, but first it is going to serve as a sample for some classes I'm proposing at my parents' retirement community. I'm also thinking dishtowels would be a good project for my Gift Club at school. I have to find inexpensive crafts because I pay for all the materials! It's sad that there is no money because my students are mostly on free/reduced lunch and they jump at the opportunity to make gifts for their families. Such is the state of education in America. My reading is all about work, too. 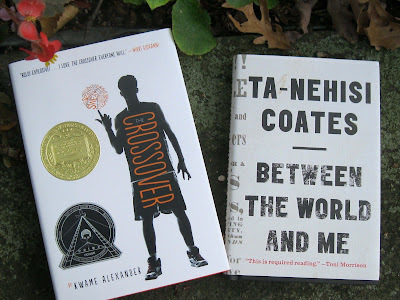 Crossover is a young-adult novel told in poetry. The writing jumps off the page, which is appropriate for a book about basketball. However, I am not a sports fan, so I am forcing myself through it. I think it will be a great read-aloud for my crew this year. Between the World and Me is writer Ta-Nehisi Coates book-length letter to his 15-year-old son that addresses living in the United States as a black man. It is very good and very intense. Painful, at times. I'm hoping to find passages I can share with my students. After these two reads, though, I'm picking something that is just for me! Joining up with Keep Calm and Yarn Along. Hope to see you there! 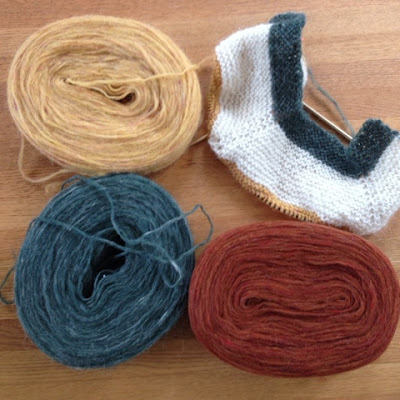 Not long ago, I messed up my very simple Pelerine shawl by missing the end of a round. Inadvertently, I began knitting in the round, which totally disrupts the garter stitch. 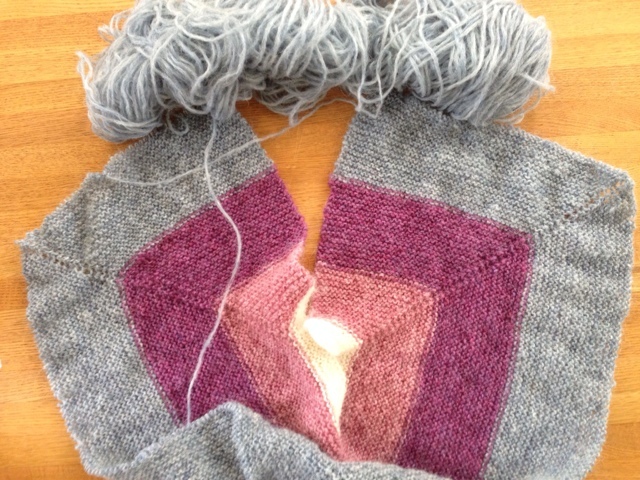 I painstakingly pulled apart the Unspun Icelandic wool and reknit. ... until I made the same mistake again. I decided that there was a message behind making the same, very stupid mistake twice. I pulled out the needle and cast on a second Pelerine. It's all about the colors. The pinks and blues in the first one are my colors. However, the person I want to gift prefers Earthy colors. So, I ordered a few disks from Schoolhouse Press and launched into a second shawl. And I'm so glad I did. I hate rushed knitting. What's the point of that? Did you notice how the disk of Unspun Icelandic in the first picture has been elongated? That's what happens when you leave the disk sitting around the living room of a house with cats!! It's a beautiful sunny day here, but cold. I went for a walk with a friend this morning and we both wore mittens. Oct. 3 is a little early for that, even in Wisconsin. There is so much around the house that I should be working on, but I've been having quite a bit of neck pain lately, so I suspect I'll have a lot of knitting time while I apply heat. Any home remedies for neck pain?